Wow! 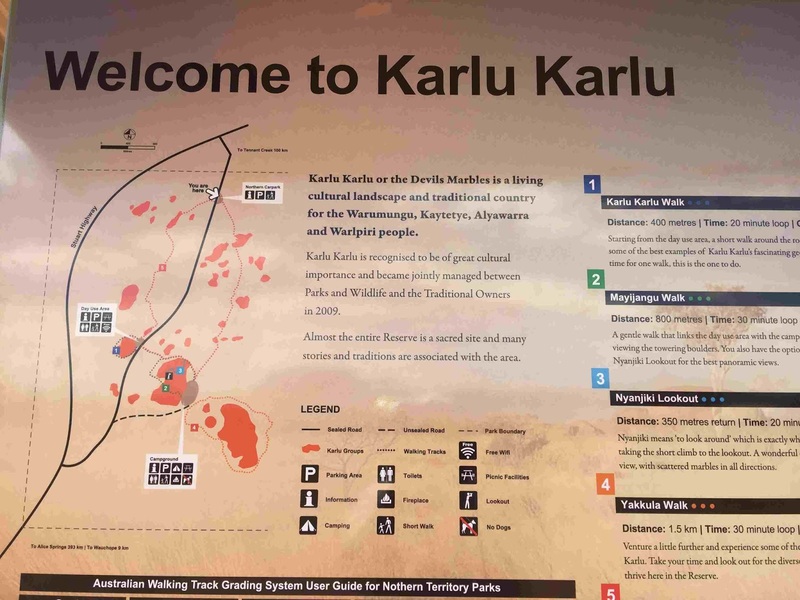 The Devils Marbles or Karlu Karlu are spectacular. 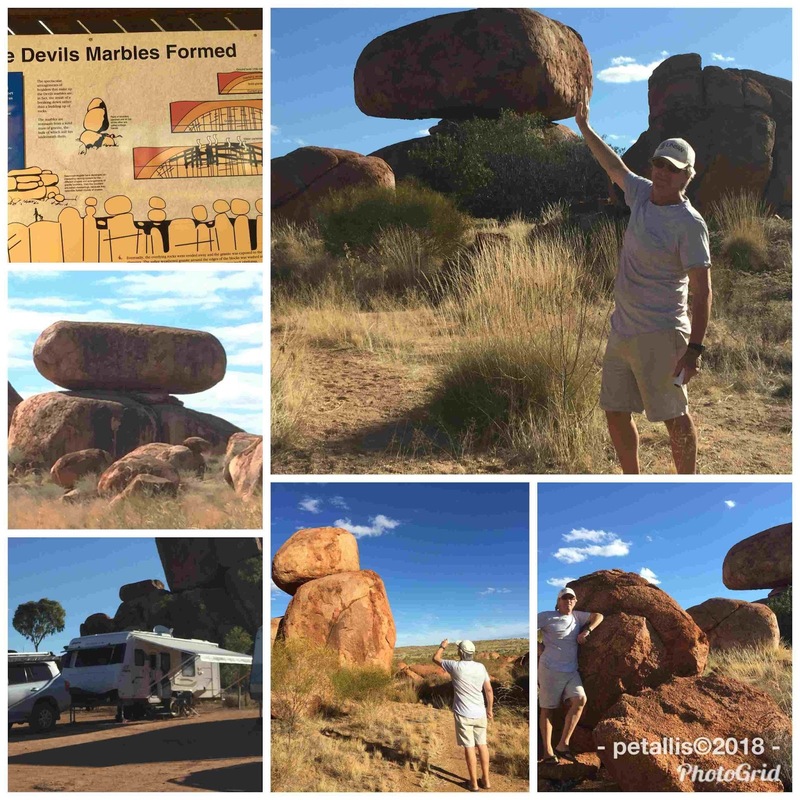 The Devils Marbles are more than the two most photographed boulders. Located 110km from Tennant Creek, this was our overnight stop. The Devils Marbles Conservation Reserve is just off the the highway, in fact, it is on the old highway. 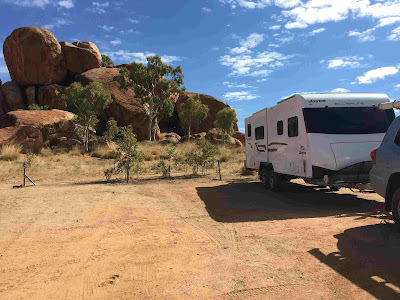 Our first stop was a carpark that overlooks the two 'famous' boulders, then we drove around to the camp ground. We parked the van in among many other vans right at the base of the Marbles. Like the Pebbles, they are formed by the upsurge of molten rock millions of years ago and formed blocks of granite. When cracks developed and erosion took place, this formed many rectangular blocks that over time have eroded to form rounded boulders. 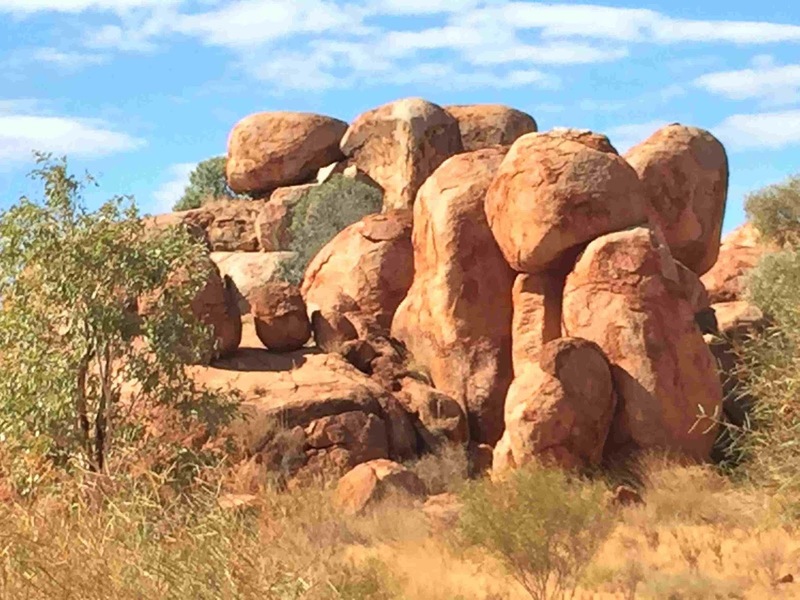 One can walk between the boulders on dirt tracks between the spinifex that meander around the formations. Unlike the Devils Pebbles, there are no gravel tracks to stay on, only the tracks made by thousands of tourists each year. Every now an then one comes across a small arrow marker pointing back to the campsite – good idea as it would be easy to get lost among the rocks. There are also many signs saying to respect the rocks and not to climb on them – sadly children were allowed to climb all over them. Aboriginal Dreamtime tells us the marbles are the eggs of the Rainbow Serpent and have magical powers. It is a sacred site. There are many walks, long and short, and there are signs along the way that explain how they were made and the Dreamtime. It is eerie and quiet and really makes one think about the power of the rocks. 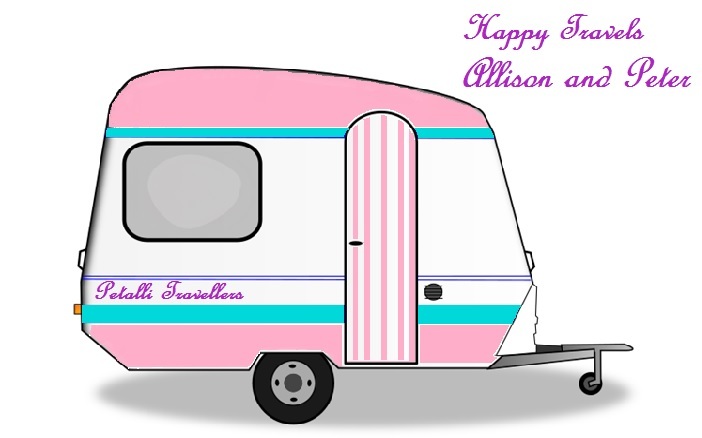 We are fortunate that we choose to do only short drives of 100-150km a day. 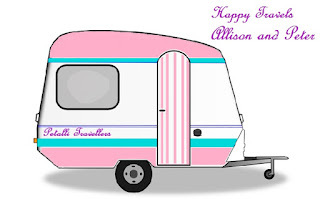 It means we get to sites early and usually have no problem getting a good site. We were lucky to arrive when we did at the Devils Marbles as it quickly filled up and overflowed out onto the roadway. In saying that it was still a quiet night and morning. 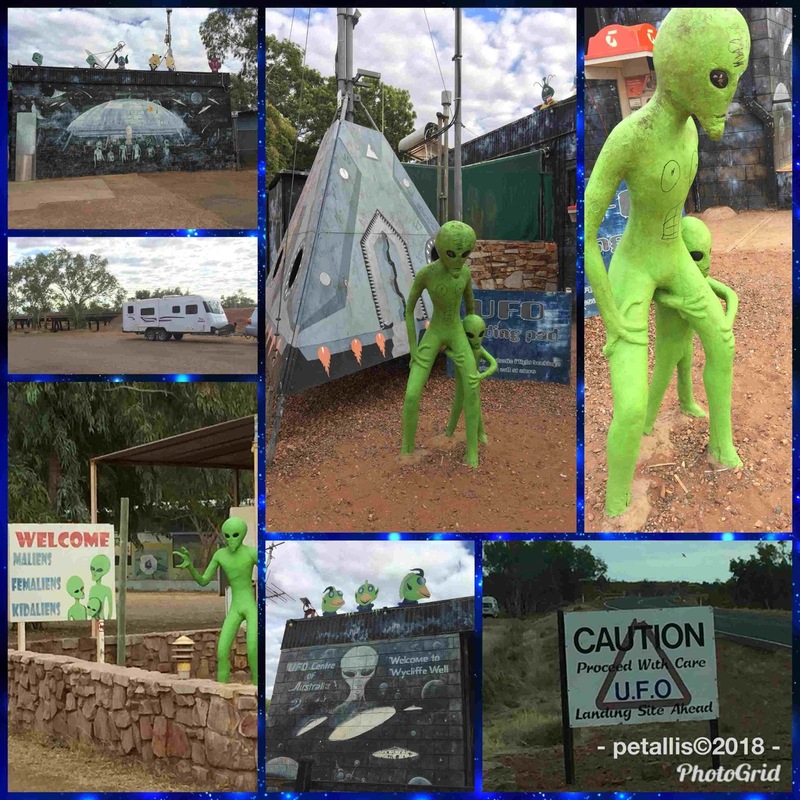 With a slightly longer drive the next two days, we headed of earlier than normal with the first stop Wycliffe Well being the self proclaimed UFO capital of Australia. Some very enterprising owners I think. The site was once a market garden to provide fresh produce for the army during WWII. The Wycliffe Well provided ample water and the soil was very fertile. 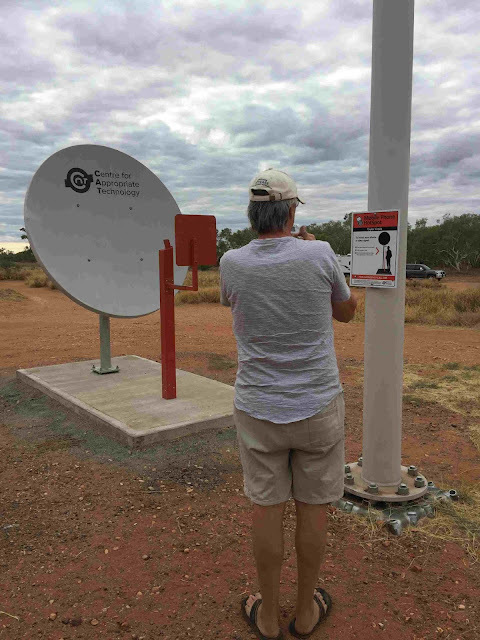 Since we started driving in the NT we have often seen communication dishes at rest areas. We saw one after leaving the UFO site and decided to stop to have a look. A really good idea. One puts their phone on a red holder, waits about 30 seconds and should get phone coverage. Didn't work for us, but maybe we needed to wait a little longer. Next detour was to another WWII camp. All that is left of this one is concrete slabs. Sadly, other than an information board at the beginning of the camp, nothing is marked. It is about 2kms from the highway on a dirt road, and the sign comes up very quickly. This was the first overnight stop for troops moving north from Alice and operated from 1942 to 1945. 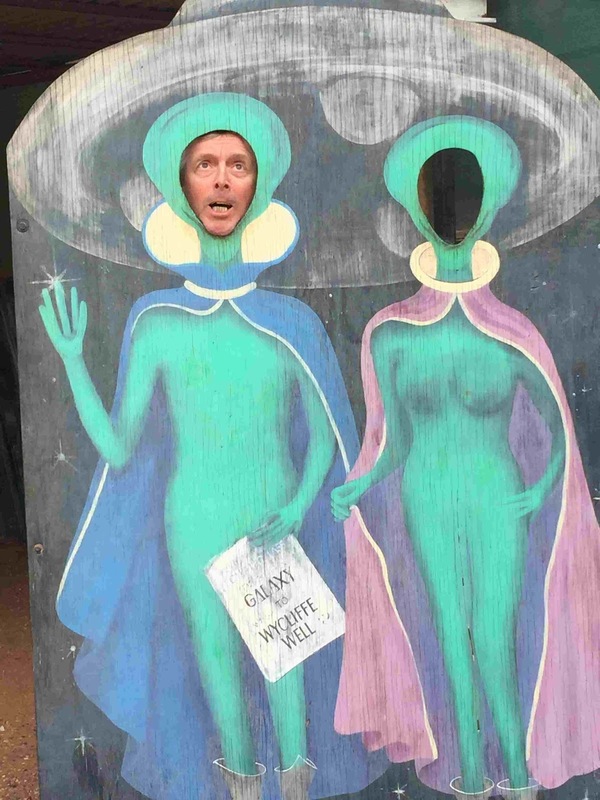 It was hard to work out what was what from the map. 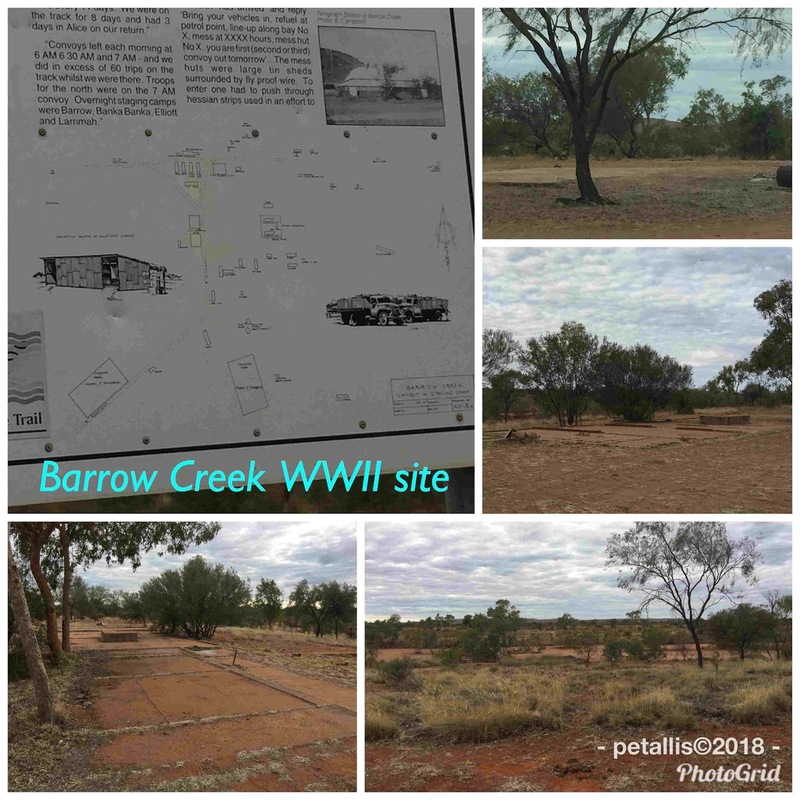 If the Barrow Creek had been on the map it would have been easier. 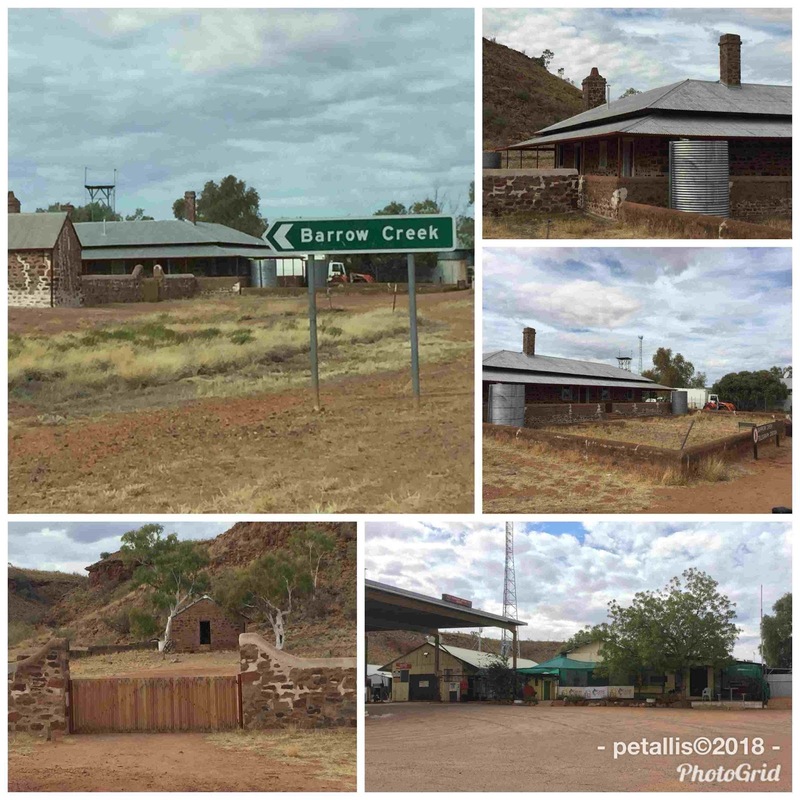 About 30 km down the highway is Barrow Creek. An old telegraph station, pub/petrol station, caravan park, and the graves of two telegraph station workers killed by local Aborigines in 1874. The town is named after John Henry Barrow, who migrated to South Australia in 1853. He was a preacher, journalist and a politician. The town came to be established in 1872, after the telegraph station was established. At the time Northern Territory was ruled by the South Australian Government, so the naming of the town after a South Australian politician was not that unusual. 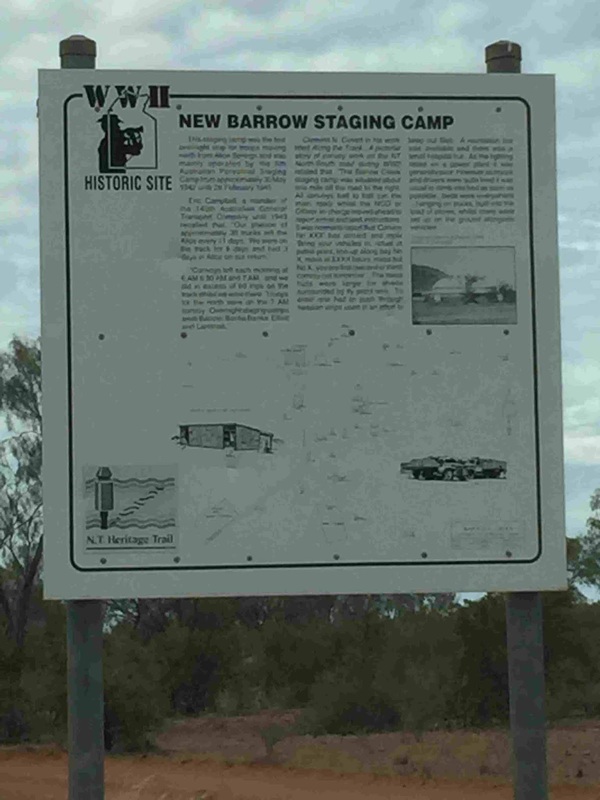 Barrow Creek also has a sad/morbid history. It is the site of the last major Aboriginal massacre in the NT, at Skull Creek, as a consequence of the raid on the Telegraph Station in 1874. 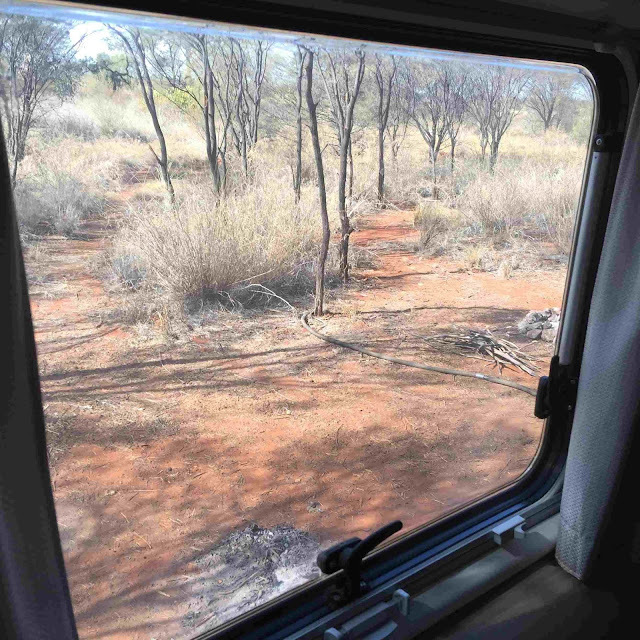 The area is also the site of the murder of English backpacker Peter Falconio in 2001. We had a walk around the Telegraph Station, which was in a smaller area than the Tennant Creek one, then continued on to our camp for the night – Prowse Gap Rest Area – a free camp on the highway with many flat sites behind the rest area. The rest area has toilets and will soon have a telephone site. It is named after W. Prowse, who was a member of the Overland Telegraph survey party.